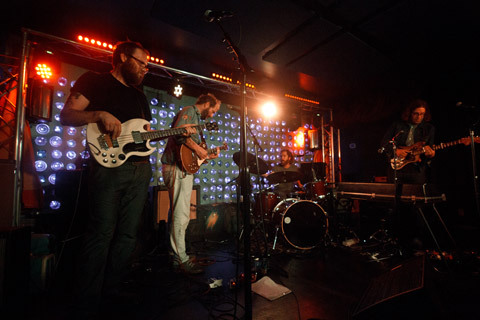 Megafaun are one of several Triangle-area bands that have gone national recently, and they are also one of our personal favorites. Since being introduced to the band when they opened for fellow Triangle-area band The Mountain Goats, and our own Sharon Van Etten, we have followed their progress to becoming a headliner and national act in their own right with pleasure. But on their home turf, Megafaun aren’t just an up-and-coming act from out of town; they are stars in their own right. The Americana-driven band was the centerpiece and part sponsor of this outdoor day show on the final day of the Hopscotch Festival, and they brought with them several other bands we’ve been longtime fans of: Oneida, Mount Moriah, and the db’s. Coming on last, Megafaun arrived to a teeming and rowdy crowd that was as thrilled as I was to see them joined by not only the improvisational drummer Chris Corsano, the Nashville-based guitarist and Lambchop member William Tyler and Adam Granduciel of The War on Drugs. Clearly feeding off of the energy of the crowd, the band gave us a rollicking hour-plus set that didn’t shut down until the band said so. We have watched the band move from a trio to a touring foursome already, but with the additional players rotating in and out of the cast, Megafaun became a Southern juggernaut. With Graduciel onstage, the band performed a “cover” of the The War on Drugs’ “Brothers” with Graduciel on vocals. Lighting up the streets of Raleigh with their all-American charm and good humor, Megafaun ruled this day, and inaugurated the final day of the Hopscotch Festival as no other band could. I recorded this set with a soundboard feed provided by the extremely professional and high quality staff of North State Sound, together with Schoeps MK5 mics in the omnidirectional setting to provide a live feel. This show is, as the band says themselves, mixed on the fly, and you will hear some occasional fluctuations in levels and instructions from the stage, but it is a very strong recording and document of this day. Enjoy! 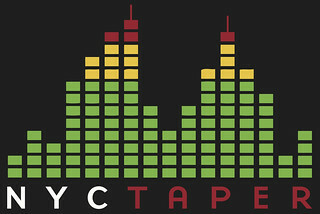 If you email nyctaper for access to this recording, we expect that you will PLEASE SUPPORT Megafaun, visit their website, and purchase their official releases including their latest album Megafaun from Hometapes Records [HERE].